Layouts are designed to specifically highlight important patent grants such as "First Issue", "Most Successful", "Most Recent", etc.., layouts can be modified to accommodate your specific needs and/or number of patents granted to each inventor. 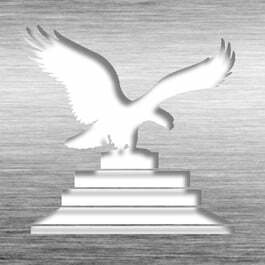 Plaque is engraved/imprinted on a Silver HD or Gold HD Plate, mounted on a hi-gloss piano finish board, and accented with a bright metal trim. Available in different sizes for 5, 10, 20, or more patents. Also available in premium engraved Black Gold or Black Silver Plates. 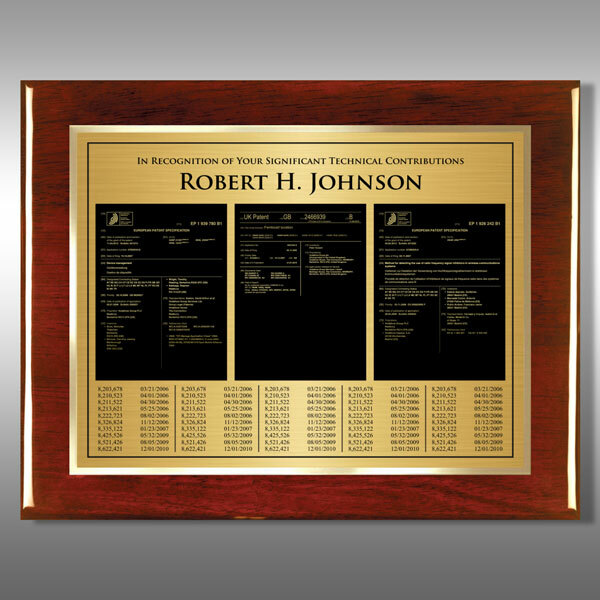 This Patent Plaque - Rosewood Milestone RP50-EG20M is part of our Portfolio Series of products, check out other products & options available in the Portfolio Series of our selection. This Patent Plaque - Rosewood Milestone RP50-EG20M can be modified to your requirements and is available for your corporate award programs.